Race-Dezert.com Klaus Rasch and Curtis Guise a couple of dirtbags is another recent statement made by off-road terrorist Mike Overcast. Why we all know how much value this kind of Grade A B.S. 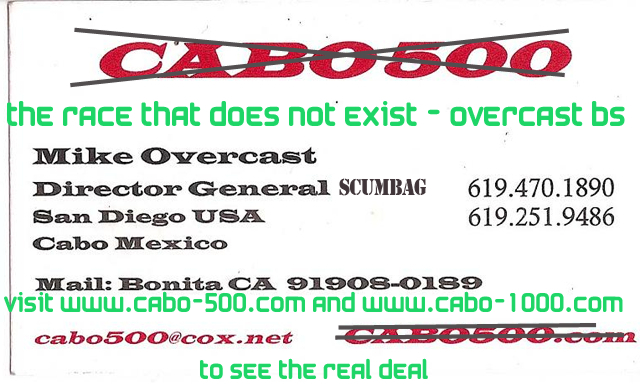 carries it is important to show HOW professional this individual Mike Overcast and Baja Racing News LIVE is active. So if you are a newbie to either the sport of off-road or plan on visiting Baja California make sure to get plenty of opinions and you will discover - this guy does not know horse-crap and he wants your best: your dollars!! The images in the background are some oft photos he did modify and publish.... Monster Scum Mike... lol what a dbag!